Put watermarks on photos at once! 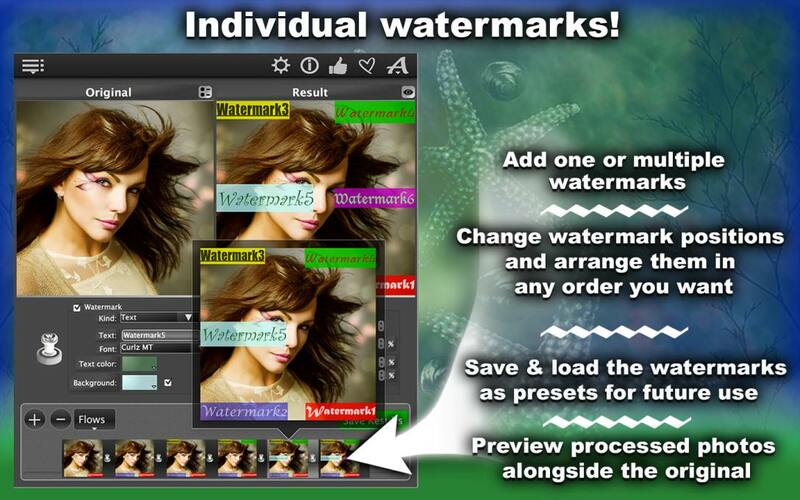 If you are looking to protect your photos from unauthorized use with watermarks, try WhatAMark! 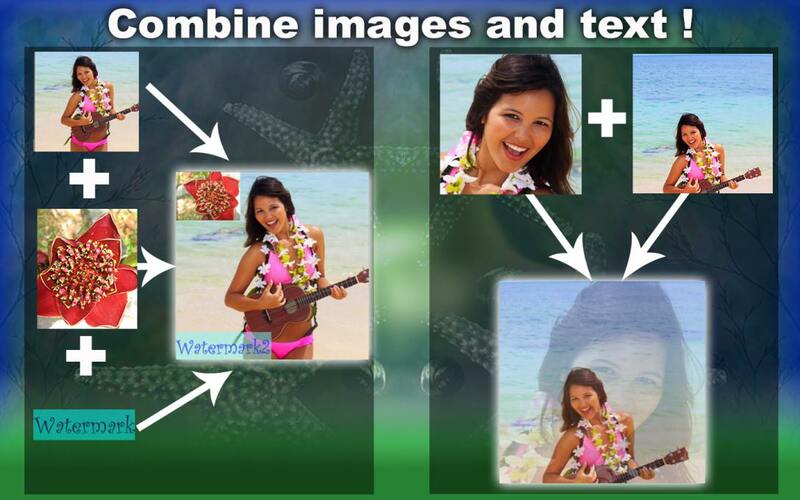 This app allows you to create an image or text overlay , multiple watermarks on the same picture, and you can even work on large batches of pictures, watermarking them all simultaneously! Want to add a text logo? Combine or superimpose different pictures? WhatAMark makes it really easy! Select the pictures you want to process and Drag&Drop them in the app window. Next, select the type of watermark you want to appear on the pictures. If you opt for a text watermark, you compose your own text, and then select the type of font, text color and background color (or you can get rid of the background). Your next step is to adjust the size and transparency of your text overlay and to determine its position. Instead of a text, or in addition to it, you can create an image watermark, such as an artful text logo, a picture or a symbol that has a specific meaning to you or your company. After you select the image you want to use for watermarking, you can expand it and adjust its transparency to create superimposed images. Or, you can make it smaller and use it as a traditional watermark, or combine with different pictures for an artistic touch. 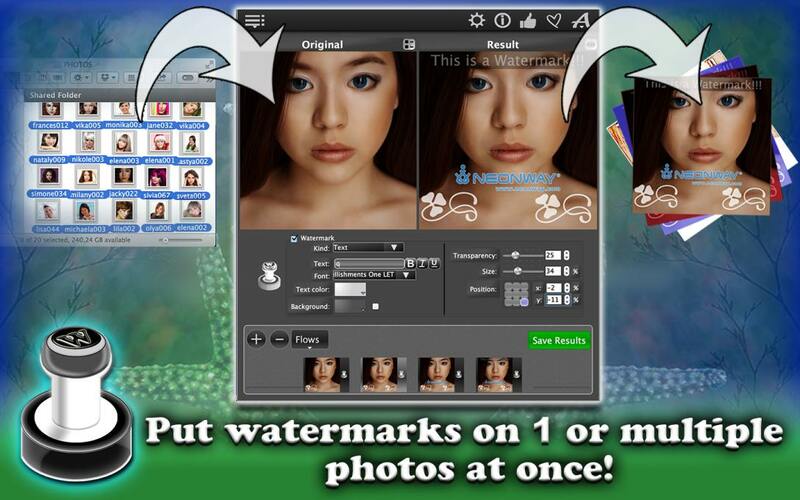 You can change the order of the watermarks on your pictures any time, preview each step in the process separately, the details of every picture, the results alongside the original pictures or even the results of your entire batch of pictures! If you need to use the same order of operations over and over, save them as presets. Almost there! 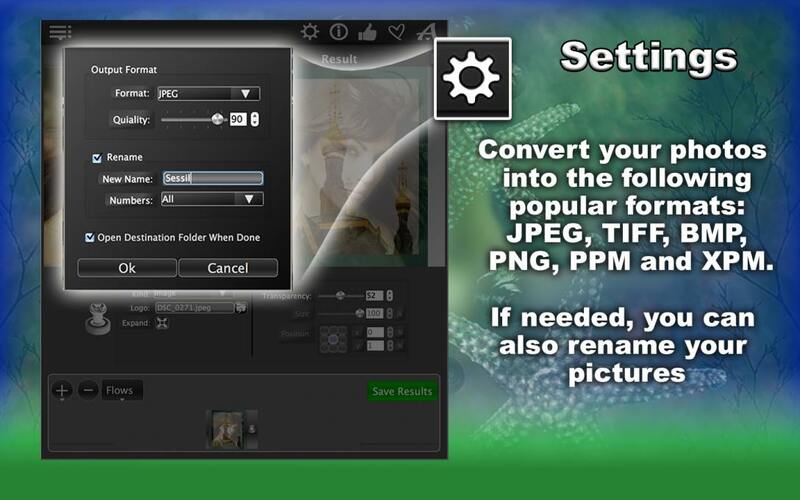 Select a format for your pictures, rename them, if you want, and click Export Results. WhatAMark will process your pictures and save them in a separate folder on your computer. Really fast and easy! Hello and welcome to WhatAMark! This app will help you protect your pictures from unauthorized use by putting watermarks on your photos, including images or text. It even works on large batches of pictures, putting one or more watermarks on them simultaneously! In addition to that, WhatAMark can be used to combine pictures and layer them for an artistic touch. Let’s get started! First, let’s get the pictures you need to process and Drag&Drop them in the app window. Next, click over here to select the type of watermark you need. You can select between text or image. Let’s do the text first. Type your text here, now you can select the type of font. We can make it bold or italicized, or underlined. We can change the text color. You can change the background color or get rid of the background altogether. And now, you can play with these parameters, either in percentage mode or in pixel mode. Let’s do it by percentage. We can change the size of the watermark, its transparency and its position. We can add multiple watermarks to pictures. Click on the plus sign right here. See? Continue working on the same picture. Let’s make the next one an image, and this one is a default image. We can expand the image or make it smaller again. The same thing here, we can play with the transparency, size and position. Let’s position it over here. Let’s create another one. Click on the plus sign, and let’s make this one a different image. Click over here and select from your images. Here we go! Now, we can expand this image again and play with its transparency to create superimposed images. See? Or, we can make it smaller again and just combine different pictures. This is how you combine pictures. We can position it differently. You can change the positions of the watermarks and bring them in any order you like, any time. Like so. Say, if you want the flower, this image, to be the first watermark, here it is. Let’s view it. Right here, see, that’s the first watermark. This is going to be our second watermark, so it’s this text and the picture. And this is our third one, all three watermarks. Like I said, you can change them any time. You can preview processed photos here, zoom in and out. Or, you can also preview the processed pictures alongside the original by clicking here. If you would like to use the same operations over and over, you can save them as presets. Click on Flows, Save, name this flow, OK.
Now, if you are happy with the results, go to Settings, select a format, let’s do this in PNG. And you can also rename your pictures here. 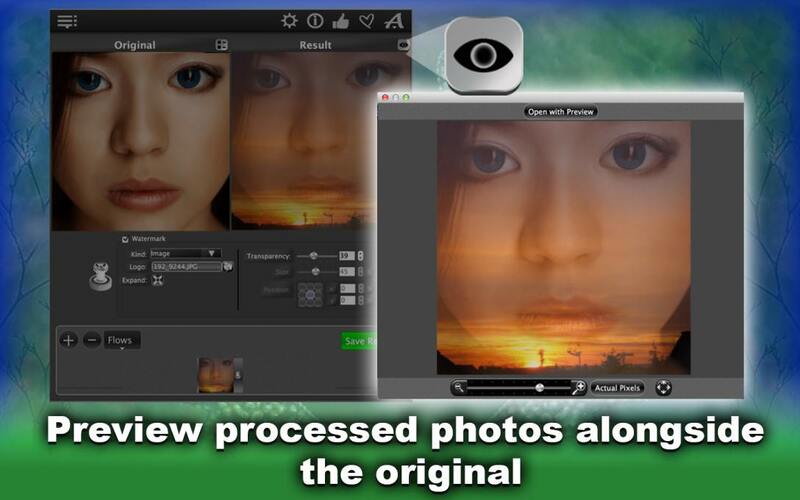 Now, if you are done, click Export Results, and your pictures will start processing. When the processing is completed, they will show up in a separate folder. Here it is! Here is the folder with your pictures! And that’s it! Have fun with WhatAMark!